This is a pretty popular Blogger hack that lots of people have asked me about. Instead of answering to each email individually, I thought it would make more sense to write an article about it. First you need to edit your existing code so I recommend copying and pasting it into notepad or any text editor. Also, it’s smart at this point to create a backup of your template just in case something goes wrong. Now do a search (CTRL + F) within the text editor for the following code post-header-line-1. This is the default code that Blogger includes but some custom templates remove or change this code so you might have trouble finding it. If you can’t locate this text then try searching for <data:post.body/> instead. Your template will for sure have this since it’s the tag that actually prints the body of your post. Now depending on which code you were able to find will determine how easy the next steps will be. You might need to do some detective work first in order to get this working properly in your custom template. The idea is to get this new code into your template before the <data:post.body/> tag. Keep reading and hopefully the explanation will illustrate the concept clear enough so you are able to adapt this hack to your custom template. Add the following code below the <div class=’post-header-line-1’/> and <div class=’post-header-line’> tags if you’ve got both. Notice in both examples that the code in yellow and the <data:post.body/> tags are the same — it’s just tag above it that will differ based on the template you’re using. Now let’s add one more bit of code which will actually create the “read more” link in your post. This code will go below the <data:post.body/> tag so copy the following and paste it in. Feel free to change the “Read more…” text to whatever you want the link to look like. Be careful not to delete any other code during this process. This code will be the same no matter what template you are using. Just make sure it goes below the <data:post.body/> as shown in the image above. Ok, you’re all done editing the template code. Paste it back into your Blogger html window and save it. If you get an error, you made a mistake. The most common mistake is to accidentally delete a > or < while pasting in the new code. If it saved successfully, it’s time to move onto the next step and modify a quick Blogger format setting. Ok, we’ve got everything all setup so it’s time to go and test it out. Hopefully you’ve got a new post in mind for your blog. If not, then we’ll just create a test post which you can later delete. When you click on the “Posting” tab, you’ll notice that the post text area is now pre-populated with the <span class=”fullpost”> and </span> tags. If not, then you didn’t save it properly so go back and re-read step #2. So when writing your new post, anything you put above the <span class=”fullpost”> tag will be the teaser text. The main body of your post needs to go in between the <span class=”fullpost”> and </span> tags in order for the “read more…” link to work properly. See the screenshot below. Sometimes pictures illustrate better than words. 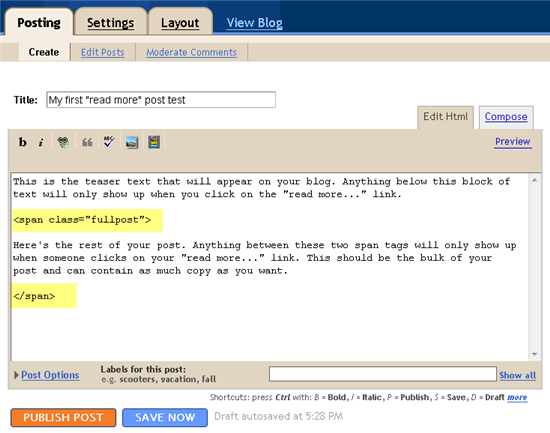 Now publish or preview your post to see the “read more” hack working on your blog. If it doesn’t show up for some reason, go back and run through the steps again. Most likely you pasted the code blocks in the wrong places. It’s difficult to troubleshoot these issues since each template can be unique so please make sure to double-check your template before asking for help in the comments section below. Here’s the live post with the “read more…” link properly working based on the text I used above in the post text area. If you want to go back and update your old posts with this new “read more…” feature you can. Just go back and edit each post manually. Essentially you’ll need to paste in the <span class=”fullpost”> and </span> tags breaking apart the post into two parts. For some posts, you might not want to use this feature at all. If that’s the case, just delete the <span class=”fullpost”> and </span> tags from within your new post text area. Then your new post will show up entirely just like it used to before you implemented this hack. Enjoy! hello thank you for the link. i was able to get it to work but when i tried to center it and increase its size & change its color blogspot would not let me do it . A simple and best way I believe is pointed here. I downloaded a template with readmore link. how can i remove readmore on my post? Hey Blogger has a new post editor that you can just use to get the “read more” button: Just go settings and under global settings you can change to the new editor. This will allow you to add the “read more” button when typing your posts. If you still want just go to my blog and read the post that says: “Creating a “read more” button or “after the jump” summaries.” at http://excessblogger.blogspot.com. thankyou. with a little editing, it works for me. Thanks for the tips, but not one website I have found can help me with this and I am starting to think there is something in my template that is blocking it. I would love if you could help me out with this, I have tried at least 6 sites with no success!! I did exactly as you explained here! But one issue… I realized that this cannot be applied to the old posts. Is there a way it can be done? Would really appreciate your help on this! Well Tsowe…i just checked out your blog. it shows the entire post and then the read more option. It’s not supposed to be that way. i can give you the code.. I have this hack installed already and I’ve been using it for a while. I didn’t noticed before though that if I have a list (ul/ol) inside the fullpost tag, it does not hide the content of the list instead it shows it right away. Appreciate your help on this. By the way, it happens on google chrome. I checked in IE and everything looks fine. Thanks a lot it help me a lot..
Hi, thanks for the tutorial, it was very helpful! But: There is so much space between text and “Read more” button. How can i change that?? Useful post. I have already applied your suggested tips on my blog and to my surprise I have seen every single strategy worked perfectly. Thanks buddy. Thank you so much. and its variants worked in the past. Now, it fails in Firefox 4.
is an inline tag, intended to enclose and apply styles to text within a paragraph. 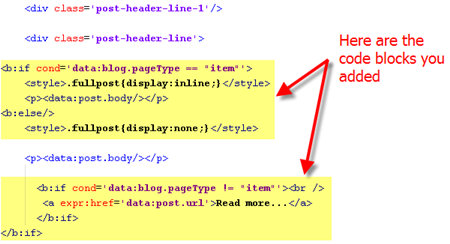 According to HTML specifications, it cannot enclose a block level tag like heading, paragraph, or . Clearly, Internet Explorer and older Firefox versions did not enforce this rule. Now, Firefox terminates a when any following block level tag appears. is block level and can enclose everything which follows, including other and tags. So, use instead of for implementing the “read more” feature, to assure your html will not break in the future as browsers become more compliant to standards. Here is the above comment without the problem with angle brackets dropping out. <span> is an inline tag, intended to enclose and apply styles to text within a paragraph. According to HTML specifications, it cannot enclose a block level tag like <h3> heading, <p> paragraph, or <div>. Clearly, Internet Explorer and older Firefox versions did not enforce this rule. Now, Firefox terminates a <span> when any following block level tag appears. <div> is block level and can enclose everything which follows, including other <div> and <span> tags. So, use <div> instead of <span> for implementing the “read more” feature, to assure your html will not break in the future as browsers become more compliant to standards. Hey, please correct the span/div problem in the post itself. No everybody read the comments to the posts, and this is really important. I have spend two hours to find this but finally I got it at here… You just rocking gr8 understanding at here. This does work but it does not hide any of the pictures. Is there any way to fix this? check it here and suggest changes. Very Nice post for me and all who are searching for this one. Thanks very much brother you are genius. I added a read more Image button now and very happy. thanks again. But now, when I preview the post the “read more” hack doesn’t exist. I know there is an explanation for this, but I need an expert 🙂 to help me figure it out.